Kathleen Wynne’s Disasterous Email is Offensive to Non-Muslims and Muslims! Kathleen Wynne, a frontrunner for the Ontario Liberal Leadership race (and, by the quirky rules of parliamentary democracy, the Premiership) is looking for your vote during this weekend’s Ontario Liberal leadership race, since the post was left vacant after Premier Dalton McGuinty unexpectedly resigned in October 2012. 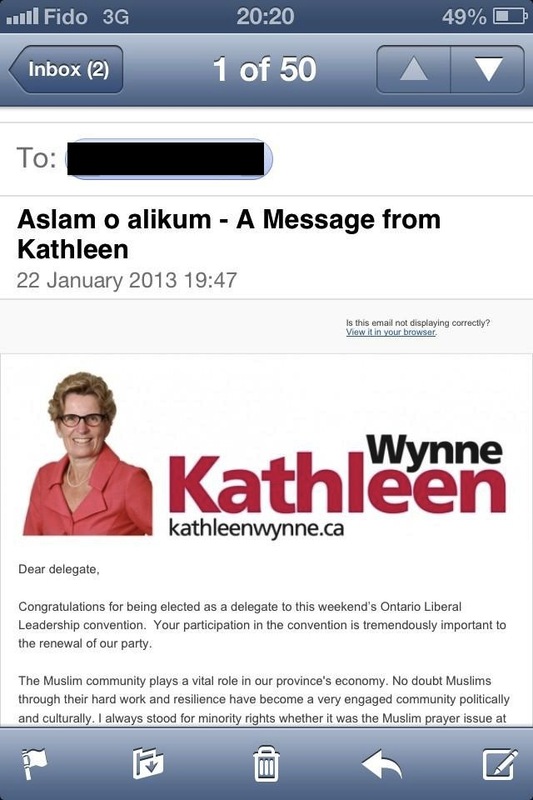 In an effort to galvanize her Muslim supporters into action, Ms. Wynne’s campaign decided to send out a mass email (that looks something like this) talking about how she supports the Muslim community, and has always been there for them. The problem with this email, is that she sent it out to anyone with an Arab name. Ms, Wynne, do you know how offensive that is to people who are non-Muslim, Arab-speaking ethnicities? Ethnicities like the Coptic Christian minority from Egypt who, despite speaking Arabic, are not Muslim? Did you ever think that you might offend people like that by assuming that they MUST be Muslim because of their Arab name? Don’t even get me STARTED on the horrendous attempt to write “Al Salam Alaikom” (Peace be upon you) – a widely used Arab greeting used by Muslims and non-Muslims. To make an assumption that any Arab name must be Muslim is like assuming that any east Asian name must be Chinese, or lumping all of the Far East countries into the general category of “Asians”. It is a highly offensive gesture that shows severe lack of knowledge about the people she is seeking support from, not to mention a horrendous research team helping her out. Ms. Wynne, if you’re going to seek support from a community, at least take the time to properly research and understand who they are and how to best speak to them. I’m not asking for you to be politically correct, but to put some thought about who you’re trying to reach out to, and to show that you’re making an effort to understand them and help them out if you’re elected. By this logic, you should start emailing “Asians” to really ramp up your vote count. I’m not saying this out of spite or hatred for anyone. In fact, I think Muslims should be just as offended by this as their Coptic counterparts. The Middle East is filled with many ethnic minorities, some of which are not Muslim. To generalize them into one category that assumes “Arab=Muslim” is an offensive gesture to both Muslims and non-Muslims.